Provide comfort for the family of Eileen Riley with a meaningful gesture of sympathy. George finally came for his Sweetheart. 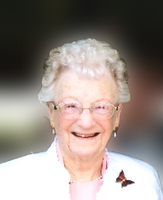 Eileen Passed away peacefully on March 17th, 2019 in Hagersville, in her 94th year. Predeceased by George (2011), loving husband of 61 years. Loving mother of Rosemary Riley-Tardiff (Christian/Buck predeceased), Greg (Lorie), Doug (Margareth). Dear grandmother of Tiffany (Jeri), Tamara (Corey), April (Dave). Gillian (predeceased), Chelsea (Shaun), Taylor, Meghan (Dan), Rachel. Great grandmother of Lucas, Paige, Samuel, Evan, Sophie, Conner, Grayson, Charlotte, Ryder and Rex. Eileen grew up in Central Niagara Falls and went to Normal School in Hamilton (McMaster) where she graduated in 1945. She began her teaching career in Stanford Township for 5 years and then in Hamilton for 2. She met George on a blind date and married him April 8, 1950 and they lived in Mount Hope. When the children came, she supplied in schools near Mount Hope. Later they took up residence in Caledonia where she lived up until a few weeks ago when she moved into Anson Place. Eileen had many friends in both communities and will be dearly missed. Thank you to everyone for their kind thoughts and words, and who cared for, and visited mom. She truly appreciated you all. Cremation has taken place. A family interment of ashes will take place in the Caledonia Cemetery, just prior to a memorial service, which will be held in the Grace United Church, Caledonia, on March 25 at 1pm. Donations can be made to the Caledonia Food Bank, or Grace United Church. To send flowers in memory of Eileen Jean Riley (Brown), please visit our Heartfelt Sympathies Store. Cremation has taken place. A family interment will tale place prior to the service. Provide comfort for the family of Eileen Jean Riley (Brown) by sending flowers. Thinking of you Margareth at this time. May your fond memories bring comfort to you and your family. With fond memories of times together. We will miss you.